The countdown is on the front page of every South African newspaper. Day by day a little banner with the FIFA 2010 logo reminds the readers that the clock is ticking. A giant electronic clock in OR Tambo Airport reminds travelers too that there is now less than a year to go. 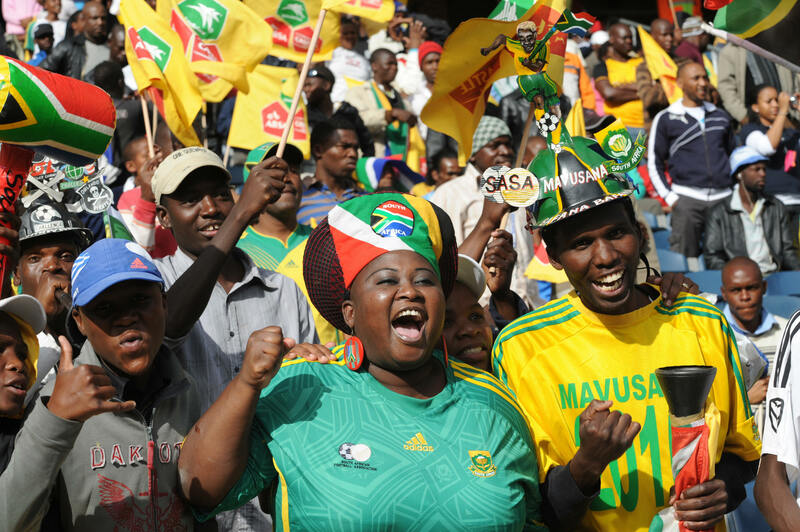 Fans cheer on Bafana Bafana in a recent friendly against Poland. South Africa has come a long way to get this far, overcoming the disappointment of a failed bid that saw Germany awarded the games in 2006; now the final hurdle. Ever since FIFA President Sepp Blatter pulled South Africa out of that envelope in 2004 it has been an uphill struggle. With the right to host came a healthy dose of skepticism and doubt. Could this African nation pull it off? Was FIFA secretly planning a backup plan? Would crime ruin their party? Most of these major issues have been put to rest and satisfied world football's governing body. The stadiums have sprung up, seats bolted firmly in place, and the first pitches are being laid. However, while most of the big issues have been solved the little ones could still upset the greatest sporting event to hit the African continent. There is still worry and concern about getting the fans to and from the games. South Africa does not have the public transport systems many visiting fans will be expecting. Most South Africans travel to and from work in overcrowded taxis. Government has tried hard the in last few years to enforce safety standards within the taxi industry but with mixed results. The introduction of a new bus rapid transit system has been put on hold after angry protests by taxi drivers who were afraid their jobs were at stake. While this new bus system will in all likelihood proceed and be ready for the World Cup, it sadly won't be tested at this years Confederations Cup. Hotel rooms will be an issue in most host cities. Durban, one of the countries big convention centers, hosts the British Lions tour later this month. Already all flights in and out are full and one needs to travel an hour away to get a hotel room. Despite a global financial crisis tickets for the 2010 FIFA World Cup are still very much in demand and hard to come by. With only five of the 32 competing teams known, already over half a million tickets have been sold to 188 countries and territories. Half of these, over 300,000 bought by South Africans. After the host nation, the biggest interest has been from the U.S. – which has already bought over 70,000 tickets – followed by the UK and Germany. South Africa's national team – known as Bafana Bafana – have seen better days. Their best showing came in 1996 when they beat Tunisia for the bragging rights of the best team on the continent at the African Cup of Nations, even if this tournament did not include defending champions Nigeria. Since then they have spiraled down in international rankings to linger below 70 and have been through five coaches in five years. But what also worries the world governing body is that while South Africans profess to love football they are not keen to show it. Recent home games for the national teams have seen half empty stadiums. In many ways the key to whether South Africans start flying the flag for their team and get really excited about the big football tournaments will be how the host nation does in the Confederations Cup. They face Iraq on Sunday in a match their coach admits is key to getting the country behind the team. South African President Jacob Zuma said on Wednesday that "the growing confidence within the national football team, Bafana Bafana and the arrival of participating teams has added to the football fever engulfing the nation." A very optimistic President speaking in Parliament whose enthusiasm has yet to be matched by most fans. They are happy to grumble at the sad state of their team but not that willing to show their undying support in the stands. The real test for readiness begins with the kick off of the FIFA Confederations Cup on Sunday. While this event will not bring a major influx of tourists to the country, it will be a crucial test for the infrastructure. Will the fans get to the stadium, will the telecommunications hold up and will the whistle blow on time? How important is the Confederations Cup in finally putting all the doubters to rest? Well, in the words of FIFA President Sepp Blatter on Wednesday "It’s definitely time to kick off now, not only in terms of the organization in South Africa, but in terms of making sure they can deliver and will deliver. That's why this Confederations Cup, one year before the big event, is crucial." Not sure why there are not many people in the stadiums as you say, but in this country, if you go into a township, you will see guys playing football in the streets, in any open field – it is a sport loved by most black people who make up most of our 50 or so million population. I think to speculate about the passion of football in South Africa is only that – speculation – come to South Africa and see for yourself. I was recently at a well known restuarant and there was some big game on the screen – all the waiters that are black people, were glued to the TV. I tugged a guy on the sleve to try and get his attention, and to no avail – he would not take his eyes of the TV and neither would the other waiters. People here you must remember that people from the townships who make up most of South Africa's population and football fans, are poor and can't always afford tickets to games. The white people who also love football, also love rugby, but us 'whities' don't make up largest football following – it's the poorer people who do. That doesn't mean we as a nation don't love football – you'll see it when you come here! I think all fears will be put to rest once the opening ceremony is over and the World Cup begins. Football overcomes everything, and I have no doubts South Africa will put on a great show, that the stadiums will be packed full, and that everybody around the world will enjoy the world's greatest sports tournament. I am getting a bit annoyed with article upon article doubting SA's ability to host this massive event. Give them a chance to prove themselves. I think because people think that it is an African country and their notion that "Africa always fails", they automatically think that the WC will fall flat. All i am saying is give them a break and after the WC you can talk. FIFA Confederation Cup will be a fantastic chance to assess which international teams are preparing better for the World Cup 2010. Yeah, I'm getting a bit tired of the non-stop condescending / patronising tone of the western media. Get over it, South Africa has the World Cup and there is no Plan B. Besides the Confederations Cup, the country has successfully hosted numerous other sporting tournaments. Why don't you write articles discussing the enormous skepticism by yourselves (despite the successes of South Africa) despite its successes in hosting other sporting events? By the way, I think FIFA should severely criticize racism during the competition. "The match was played without incident despite fears over security after Algerian players had been injured by stone-throwing fans in Cairo." Is CNN that blind or they think that the violence post the Game against Egyptians goes unnoticed and unreported! Shame on you CNN for not carrying out your job the best you can!! Most people believe that the champion this year will be European, but they forget they are playing in Africa and the soccer in this region has been rising.